Every dog owner wants to make sure their dog is happy and healthy, continuing our series finding some of the best dog products available we've selected five of the latest and best around. 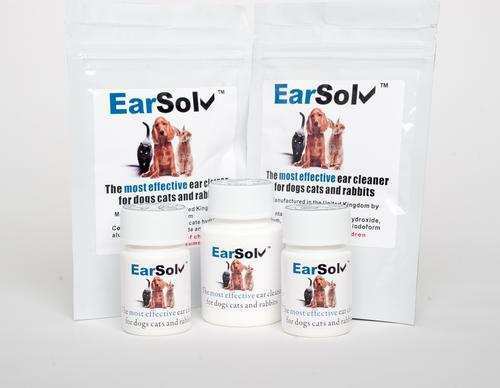 EarSolv – An ear cleaner that is winning praise from many dog owners and breeders, EarSolv works to dry up the moisture and wax which can lead to ear issues including dirty, itchy and smelly ears. EarSolv are so confident in what it can do for your dog, they offer a 100% money back no quibble guarantee. Read the many reviews and testimonials online to find out more. Johnson’s One Dose Easy Wormers – Exclusive to the Pet Trade, these Veterinary Strength broad spectrum wormers are highly effective in a single dose against common types of canine Roundworms and Tapeworms. Recommended for the worming of Puppies from 8 weeks of age then regularly, three or four times yearly, they are available in four sizes – from puppies and small dogs, to medium, large and very large dogs (or homes with more than one dog). The Perfect Calm range by Butch & Bess – Ideal for elderly as well as distressed pets. Dogs respond wonderfully to Lavender so the company created this peaceful collection to lift the spirits of our favourite companions. Infused with a rich blend of Lavender, Rosemary and Rose with base notes of Patchouli, The Perfect Calm may well have your pooch swooning to the vet and sleeping through fireworks! Infused with meticulously selected essential oils, it brings the health benefits and long-lasting invigorating scents of aromatherapy. Flex Sprinkle – A joint and mobility supplement for your dog, Flex Sprinkle reduces pain and stiffness caused by the ageing process, arthritis, dysplasia and injury. Known to reduce the adverse side effects of prescription anti-inflammatories, this supplement is a premium product with owners reporting a 90% success rate, and results seen in days rather than months. Containing a new grade of New Zealand Green Lipped Mussel that is the most effective yet, this joint supplement is easy to feed and economical to use too! GreenAcres Pet Food – Wheat-free, the GreenAcres range has been formulated using only natural ingredients. Alfalfa and seaweed are added to provide vitamins and antioxidants so your dog can be healthy on the inside and out! Priced from £7.95 (20g) – £17.95 (50g). Have you found a 'must-have' product for your dog? Let us know! Stay tuned next month for our 2014 round up of the best dog products around!